Tony Award-winning musical, Dear Evan Hansen, will make its West End debut at the Noel Coward Theatre in November 2019. Broadway producer Stacey Mindich had already announced that the lead for the London transfer will be a British actor. Casting is currently under way. 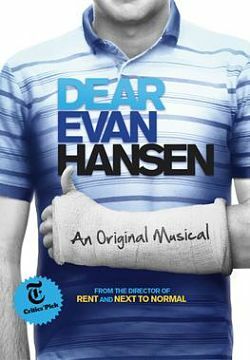 Dear Evan Hansen has taken Broadway by storm since opening at the Music Box Theatre in 2016, picking up six Tony Awards including Best Original Score for song-writing duo Pasek and Paul, Best Book of a Musical for Steven Levenson, and Best Performance by a Leading Actor in a Musical for Ben Platt. The show has a score by Benj Pasek and Justin Paul, who also wrote the lyrics for the film La La Land and the Hugh Jackman movie The Greatest Showman, plus a musical adaptation of James and the Giant Peach and the Tony-nominated A Christmas Story: The Musical. Buy tickets for Dean Evan Hansen which will preview from October 29th, with the official opening night set for November 19th. Monday – Saturday 7.30pm and Wednesday and Saturday matinees at 2.30pm. MasterPark at China Town and Trafalgar Square. NCP at Upper St Martin's Lane. Infra-red headsets held at the Box Office. A deposit of £10 is required which will be returned at the end of the performance. The box office have a portable Induction Loop 'T' system for window sales for patrons who use hearing aids. Guide dogs are not allowed into auditorium, but staff are happy to dog-sit. There is a ramp through the second side exit door on St Martin's Court. Box M has 2 spaces for wheelchair/scooter users, or 1 wheelchair user and a companion. Companions can also be seated in the Royal Circle. Transfer seating available to any aisle seat in Royal Circle.